This conveniently sized hand held electric milk frother is perfect for making your own creative beverages at home. Do you want to achieve that frothy coffee shop cappuccino? This is usually accomplished with an espresso machine, steam and a frothing jug. If you don’t want to splurge on this expensive investment, the handheld milk frother is an easy way to achieve the impressive results whilst still being excellent value for money. If you want to try something new in your routine other than just the usual filter coffee every morning, this is a fun and quick way to try something exciting. 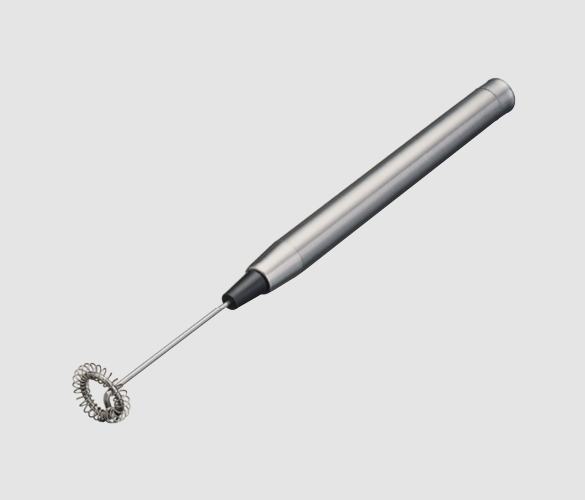 What is the best handheld milk frother? There are plenty of milk frothers on the market which have numerous different designs and materials. However, anything that comes into contact with food or drink is worth researching and making sure it’s a good investment. Firstly, it is fire resistant which is essential for a kitchen or busy coffee shop. Accidents can happen, so it is always best to take precautions. Stainless steel is also an incredibly durable material, which allows it to withhold many uses and stay looking nice and new. It is also a hygienic option when it comes to materials for the kitchen. It is easy to clean with antibacterial spray and a cloth and it won’t damage the surface of the product. This product is perfect for those who are just getting started with milk frothing. It is quick, lightweight and easy to use at home. All this product needs is 2 x AAA batteries and you are ready to start frothing. The handle has been ergonomically designed to fit comfortably in the hand and also allow for a secure grip. What can I use an electric milk frother for? There are so many ways to use this electric milk frothing device. For beginners, it is recommended to start with skimmed milk rather than higher fat milks as it is better at holding foam at room temperature. You also always want to start with fresh milk that has been in the fridge. Breathe new life into your coffee routine by enjoying frothy cappuccinos and silky-smooth lattes at home. Vanilla, chocolate or fruit milkshakes are also great to try with this device. Or why not invite your friends round and have a cocktail night? There are so many options to try, such as a White Russian, Tiger’s Milk, Godfather or Pumpkin Pie Martini. Find more inspiration and recipes on Absolut’s cocktail page.